Several of my visitors have asked for patterns for the new Curvy and Tall Fashionista Barbie dolls, so I've adjusted my most popular crochet dress for the dolls. 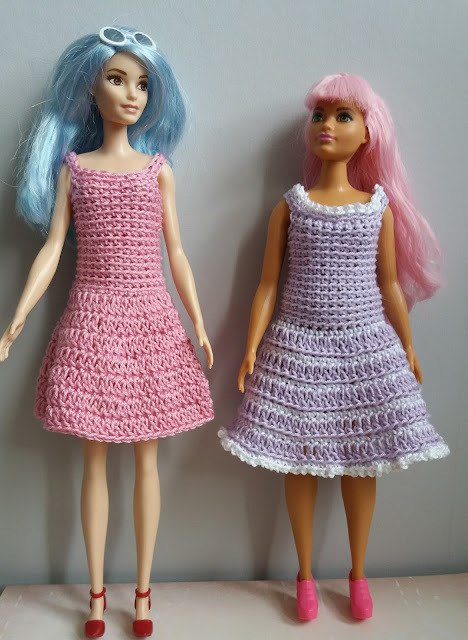 i'll have a look at the other Barbie patterns on this site and see if I can amended them to fit the new dolls so watch this space! The bodice of the dress is made first in dc rounds then the skirt is worked along the bottom hem in trebles. The tall doll has a longer waist than the original Barbie, but lengthening the torso looked a bit odd so I kept the same and made the skirt longer. Curvy Barbie - it was difficult to dress the doll with the original style of pull on dress even though I had added quite a few extra stitches. For ease of fit I worked the last two rounds of the bodice in rows leaving a small back opening which is shaped a little. If you prefer omit the shaping and add a small button. If there are any mistakes in this pattern, or you have any queries please leave a comment below or contact me. Materials: 25g 4ply yarn( I used Patons Soft Cotton 4ply) Cotton thread isn't suitable as its too fine. For the two colour dress you will also need about 10g of contrast. Slst in next dc fasten off. To finish - Neaten all ends. After each treble round, work a round of dc in contrast. Finish skirt hem using contrast work (1dc, 1ch) around. Using contrast work (1dc, 1ch) around neck edge.